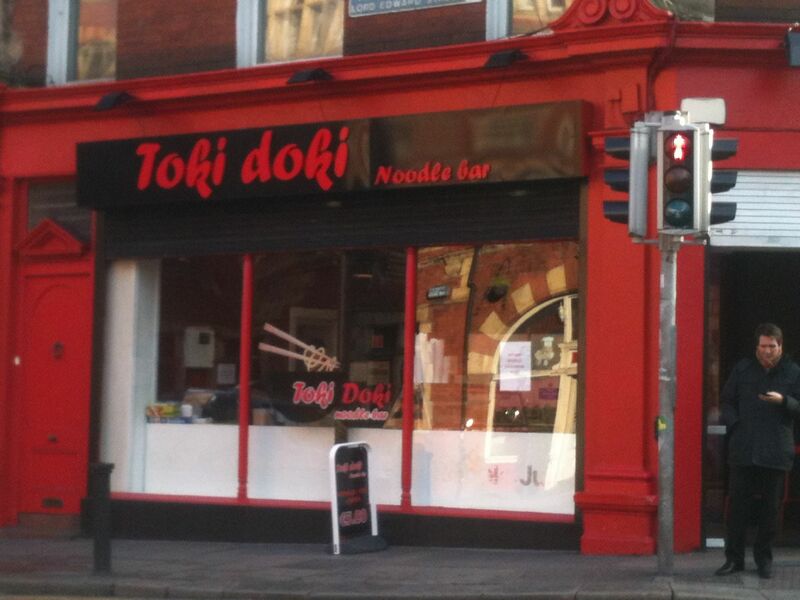 I spotted the Toki Doki noodle bar last Wednesday as I was driving up Lord Edward Street towards Christ Church Cathedral (the nicer, brighter, friendlier and more accessible of the two Church of Ireland cathedrals in the city). Toki Doki is on the corner of Lord Edward Sreet and Christchurch Place, in a premises that has seen many different ventures disappear down the black hole of liquidation. I’d like to hope that Toki Doki does rather better. It’s a brave venture. … Castle Street and, of course, City Hall. Lord Edward Street, by the way, was only built in the early part of the twentieth century. 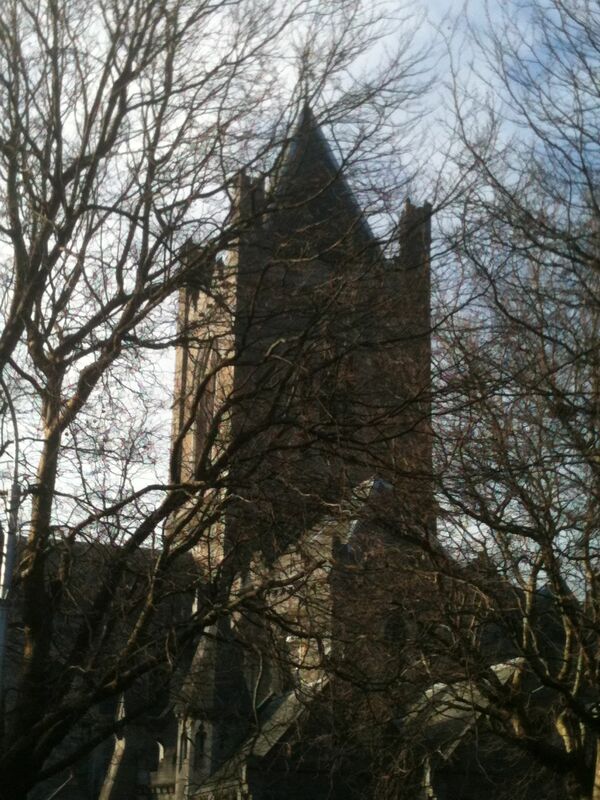 Previously one had to skirt around City Hall and wander up Castle Street to get to Burdocks. It’s plain inside, but clean and bright. The serving counter is opposite the door and, against one window and one wall is a countertop with about 5 chairs. 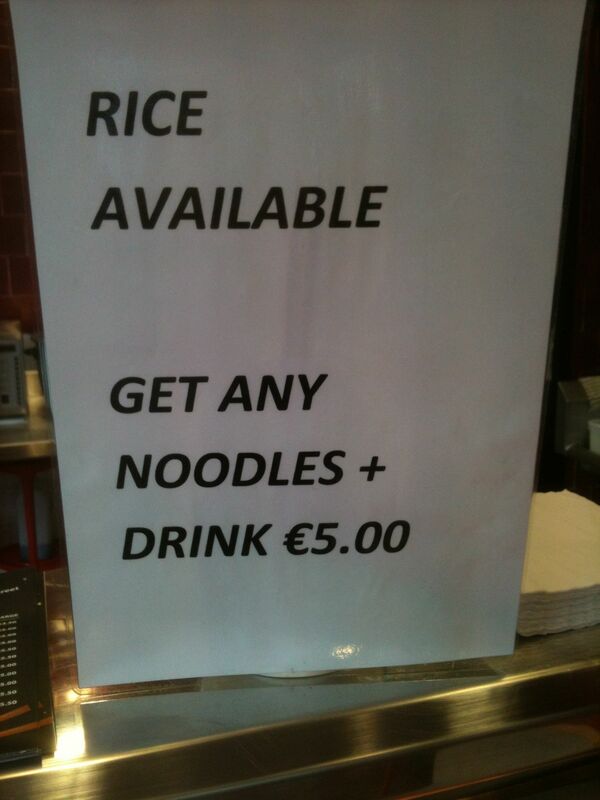 It’s mainly a take-away place, really. 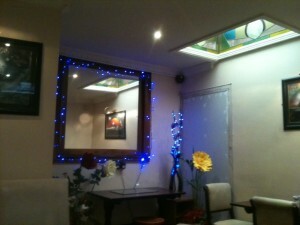 As you’ll see, all the medium dishes and several of the large dishes are a fiver or less. That’s pretty good, I think. 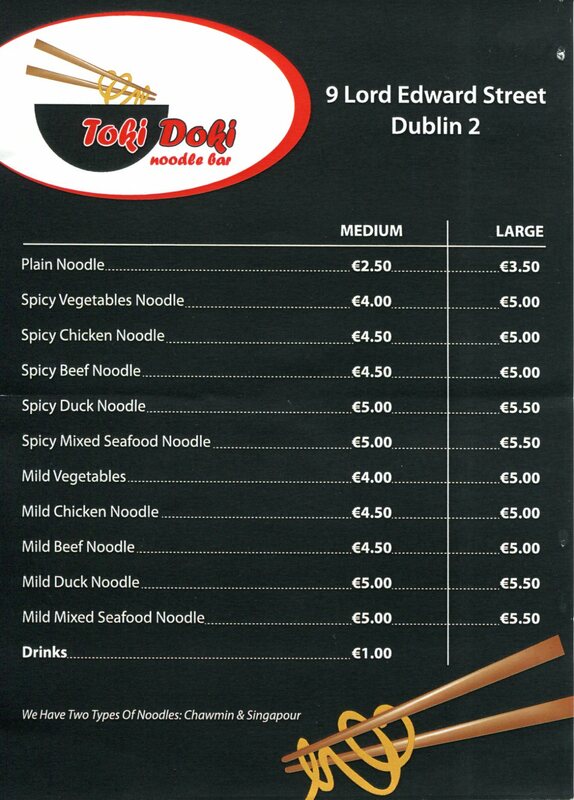 There are a few other noodle bars in the city that I’ve come across and this one seems to have the broadest range of dishes for a fiver. 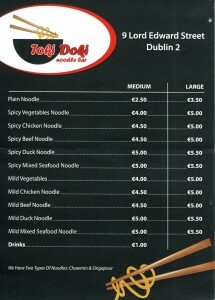 When they say ‘Any Noodles’ they mean any medium size portion of the noodle dishes on the menu. The drink is a soft drink (bottled water, coke and so on). 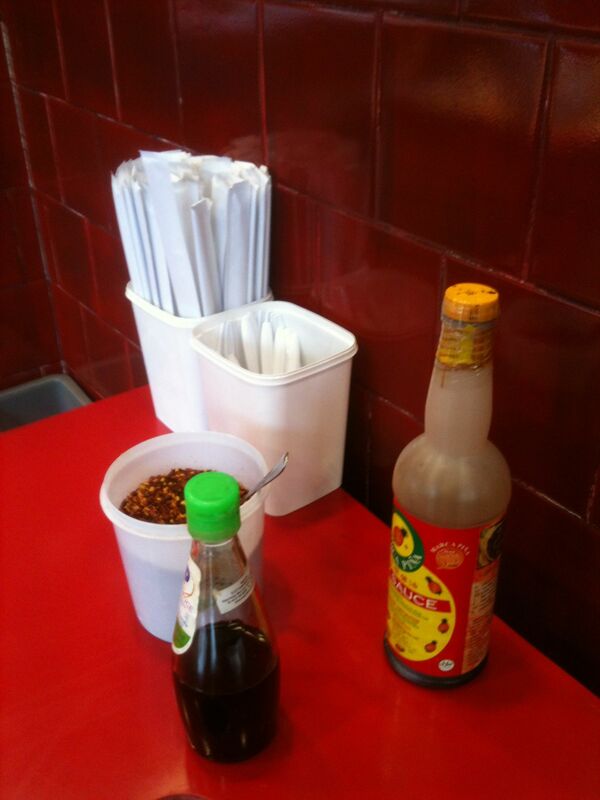 I went for the Spicy Beef Noodles and a bottle of water. There’s a choice of actual noodles (Singapore – thin ones, and Chow Mein [I think: they spell it Chawmin on the menu] – thicker ones). The server popped the noodles (I chose the thin ones) into one of those American-style asian food take-away boxes* and spooned the spicy beef sauce on top. I chose some disposable chopsticks, gave the noodles a stir and tucked in. My second reaction was: YUM! 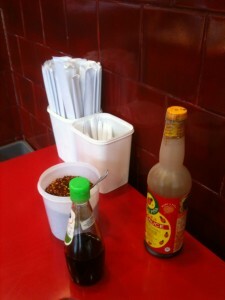 The sauce was gorgeous: it was a Thai inspired spicy sauce with a full coconut flavour, a hint of lemongrass and a good spicy heat that didn’t overpower, or even dominate, but crept up on you, in a good way. The beef element was minimal both in size and in quantity but that didn’t really take away from my enjoyment of my lunch. 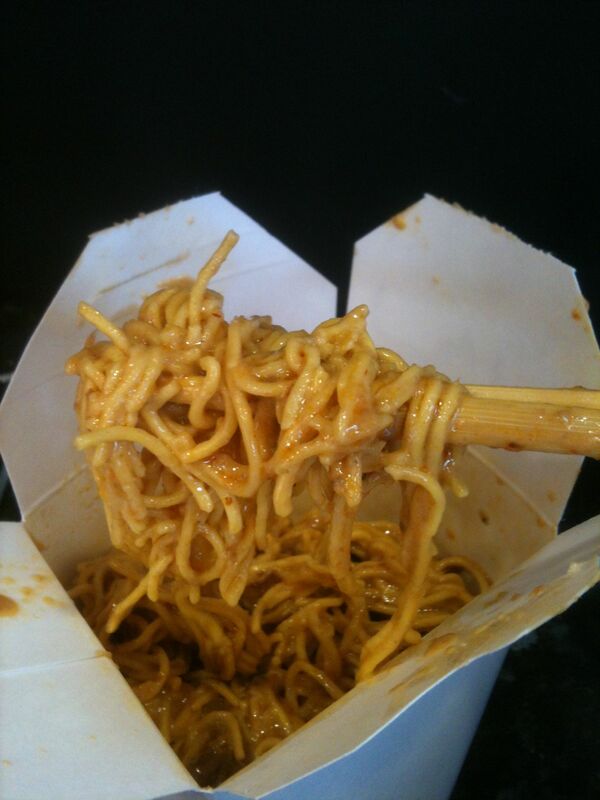 The noodles were nicely cooked and the dish was pretty filling. So filling, in fact, that I’m glad I opted for the medium deal rather than a large portion. The man behind the counter said that Toki Doki had been open for about two months. It wasn’t phenomenally busy. There were four people sitting at the counter when I arrived and possibly three or four people came in for take-away food in the fifteen or so minutes I was there. It’s a little out of the way and in an area of significant food competition. Parliament Street is full of restaurants and there are quite a few at the upper end of Dame Street too. 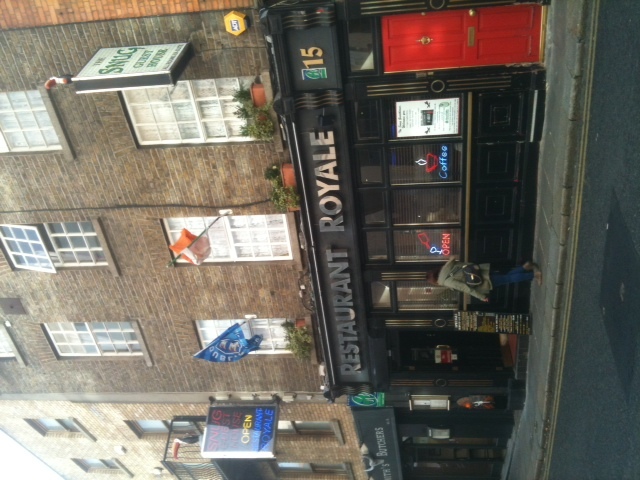 And of course Temple Bar isn’t far away either. It’s hard to see where Toki Doki is going to get sufficient customers from to survive. Anyway. 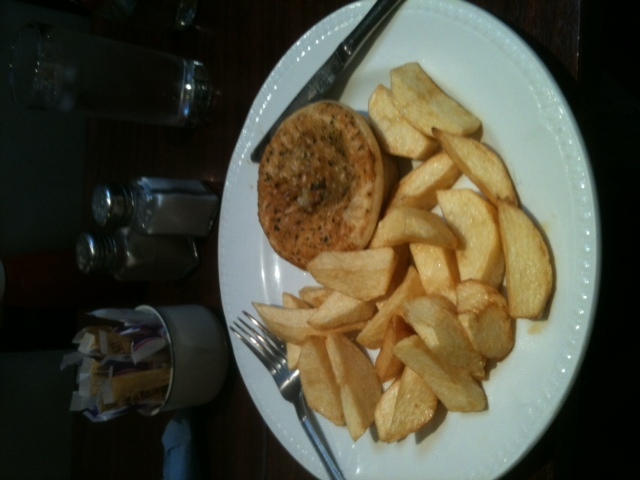 I enjoyed my lunch and I thought it was good value for a fiver. It’s a place I’d return to if I’m in the area and I recommend that you try it too. 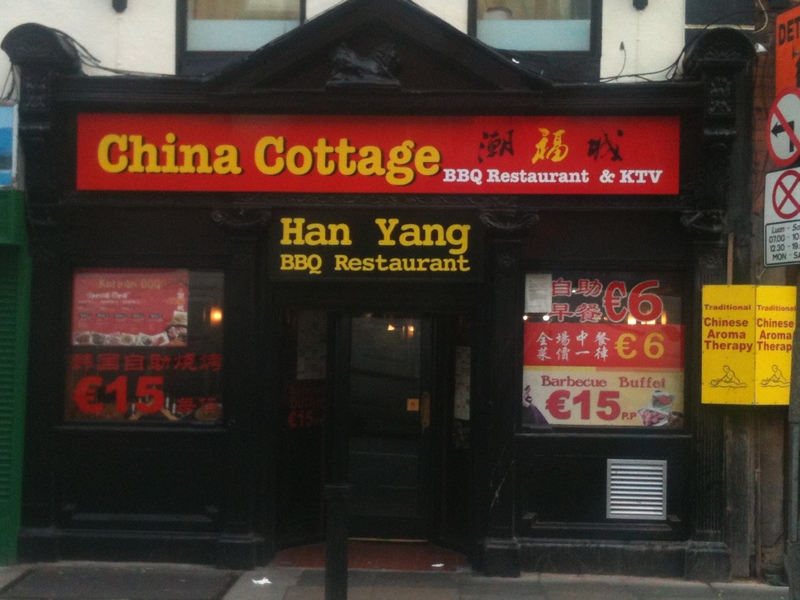 * I’m old enough to remember some of the early Chinese take-aways in Dublin and, in particular, a place called Luna which was beside the (long gone) Adelphi Cinema in Dun Laoghaire in the 1960s. 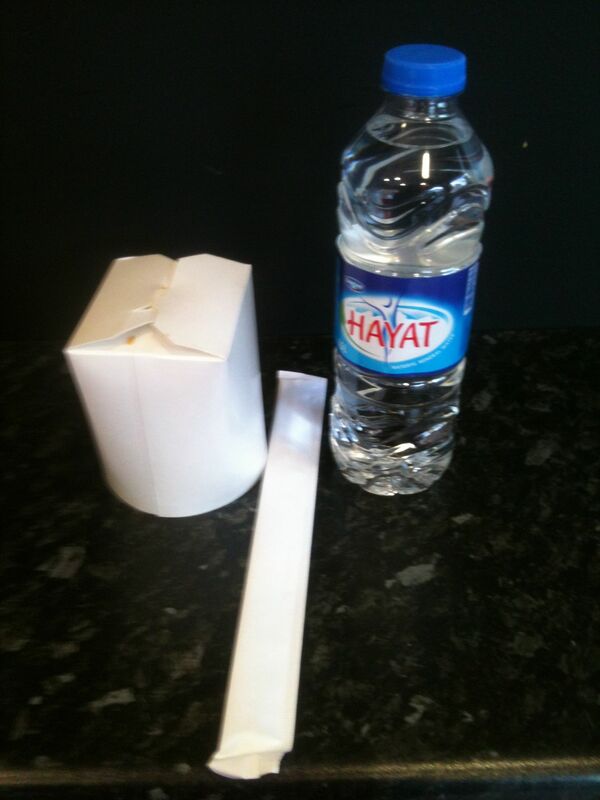 In those days you got your take-away in a regular Tupperware container which you washed at home and brought back to the take-away the next day. For some reason that I can’t quite understand, I have loved those American-style containers ever since I first saw them on US television programmes years ago. They are here now and I’m happy. This’ll be short and sweet. The young lad persuaded me to include Subway. He had a point. 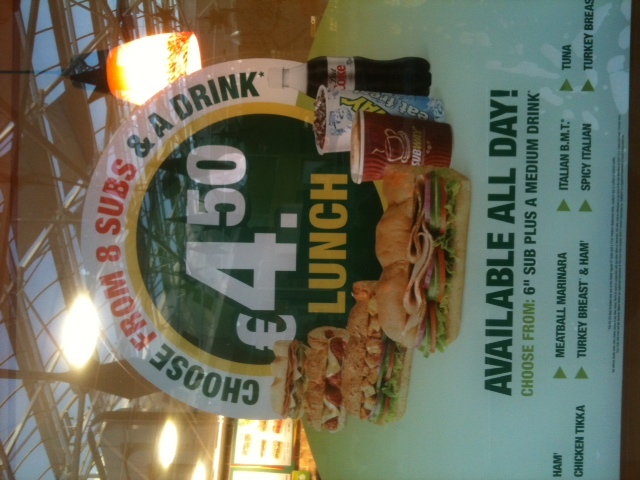 The poster in the window offers €4.50 lunch, available all day. And I did mention this offer in a previous post. 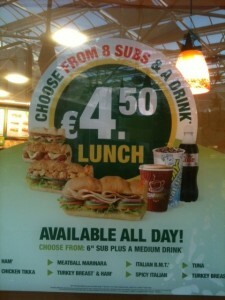 The lunch, as you can see, is a 6″ (I thought we went metric some years ago) sub (apparently a filled bread roll) with a medium drink. the filling (the choice includes ‘formed’ ham and ‘reformed’ turkey: brings to mind Homer Simpson’s ‘pressed peanut sweepings’), the ‘veggies’ (salad bits and pieces) and the sauce (various sweet and spicy confections). I opted for Tuna and the young lad opted for Meatball Marinara. The manufacturing process is quick and expertly done: the rolls are cut and the main ingredient is spread out: the roll goes in a toaster: the now warm roll is filled with additional items of your choice and squirted with sauce: the roll is wrapped and your money extracted from your fist: a plastic cup is pointed to and you fill it up from the dispenser. My Tuna sub was OK. Just OK. I chose tuna because I don’t like processed meatballs and the various formed and reformed meats didn’t appeal to me. I do, however, prefer the roll in which my tuna lies to have a crunch to it. 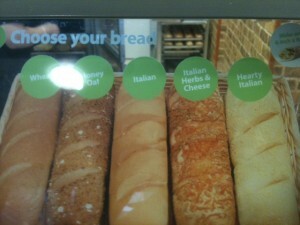 Subway rolls are soft. That’s it, really. Subway is quick and easy and the rolls are filling. Nothing special. Not particularly good value. My faith in austerity eating has been restored! Crossing from South Great George’s Street into Aungier Street, I’ve often wondered about the guest house I’ve seen out of the corner of my eye on Upper Stephen Street. Upper Stephen Street is pretty dilapidated, unfortunately. Its main feature, purely because of its size, is the headquarters of Dunne’s Stores, itself a mish-mash of modern and what looks like 1960s functional architecture. Close by (ish), ignoring the plethora of undistinguished hotels and modern office blocks, however, are Dublin Castle, Christ Church Cathedral, the Iveagh Buildings and the duller Church of Ireland cathedral, St Patrick’s. … today’s eatforafiver venue of choice. The restaurant part is physically at the far end of what turned out to be a surprisingly busy bar, on the ground floor of the Snug guest house. 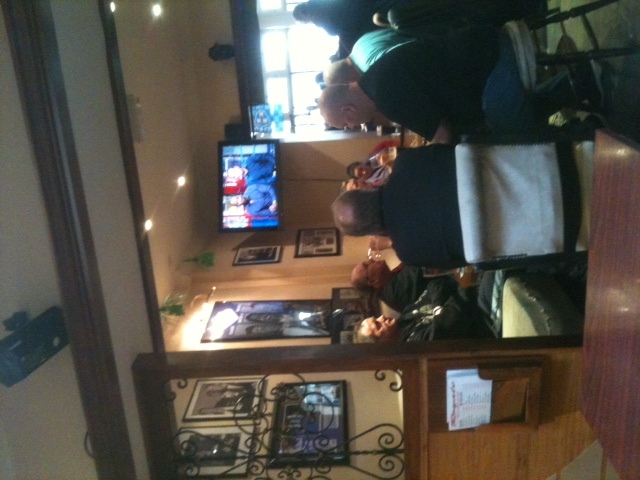 The bar is very small but today at lunch time contained about thirty men and two women, all (let’s say) over 45 and all drinking pints. Many seemed to have been there for some time, judging by the conversation volume, the occasional staggering and the frequent outbursts of singing. The atmosphere reminded me of a few pubs (The Bunch of Grapes and Larkins, in particular) my spouse and I used to frequent on Clanbrassil Street in the 1980s before they were demolished to make way for the current dual carriageway. 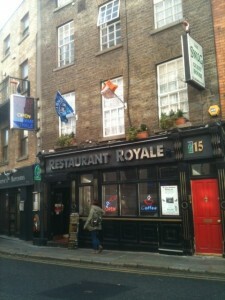 The pints in the Snug/Royale, by the way, are €3. That’s THREE EURO. 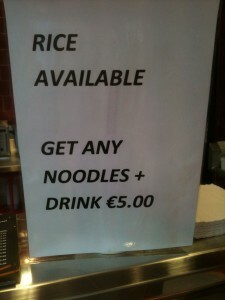 Probably the cheapest pint in Dublin. One poor man, by his own weary account, was in charge of the bar and the restaurant. The restaurant wasn’t busy, but he was. The menu is basic. There are a lot of breakfast items and then steak, chicken, fish, salads and chips. The items costing a fiver comprise most of the breakfasts (which I think they serve all day – certainly I saw one man eating one at lunchtime); caesar, tuna or warm chicken salad; barbecue chicken wings and drumsticks; and a steak pie and chips. I ordered the latter, with a glass of water. I didn’t have that long to wait. OK. 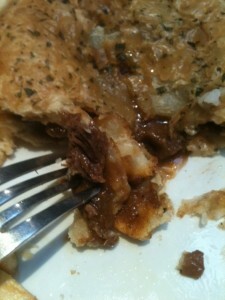 So, the pie was a pretty standard issue microwaved steak pie. Because it was microwaved, the pastry was a bit soft and the contents burned my tongue. Ouch. But that was my fault. 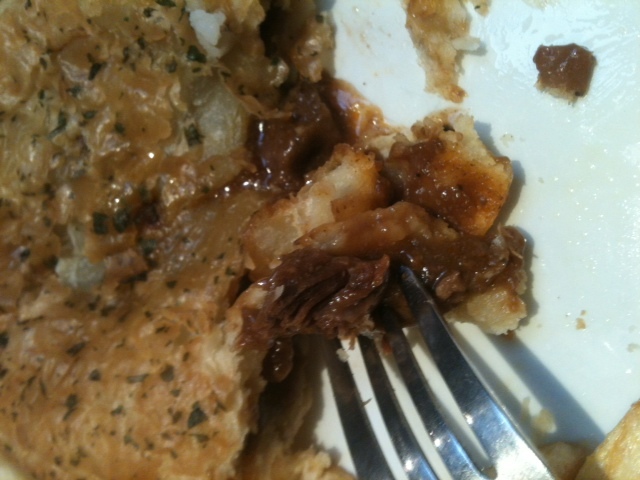 It had plenty of meat in it and the meat tasted like beef. Yay! The chips, as you can see from the first pic, were chunky. They may have been part cooked before-hand, but they were pretty good: hot and spuddy, and there was a generous portion of them. For a fiver, this was OK and there were other choices for your fiver, which is good too. The only other people eating were evidently regulars: lunchtime breakfast guy and two elderly people. I’ve been trying to think what circumstances would lead you to eat there. I mean, it’s not a first date sort of place. It’s not really a student-y place. And you wouldn’t really come across it in the normal course of events, either. It’s really, I suppose, mainly a local pub for local people (mainly from the Whitefriar/Golden Lane area), that does a bit of food. Anyway, it’s another option if you’re in the area, hungry and a bit short of cash. I had a bit of time left on my parking disc so I wandered across to the Asia Market on Drury Street in search of Encona Pepper Sauce. The place was heaving – people mainly buying provisions for the Chinese New Year, at a guess. They’ve always had a great range of frozen seafood there, including 1kg bags of huge prawns for half nothing. Today they also had fresh razor clams (which are on my must-try list), and whole live crabs for €1 each. ONE EURO! I love crab and live ones tend to be difficult to find. You can easily buy crab claws in Dublin but not the rest of the crab and I remember hearing some time ago that many crabs are de-clawed at sea and thrown back in to die. I find that a bit unpleasant. Three Euro a pint … Cheers. 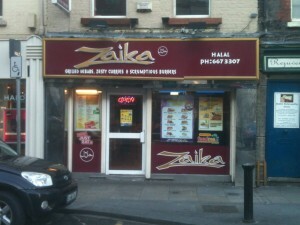 Zaika is on Lower Stephen Street, opposite what used to be Mercer’s Hospital. A big poster in the window advertises a ‘Super Fiver Offer’ effective from midday until 7pm and, for students, from 7pm until midnight also. Too good to resist? I wandered in this afternoon at about 1.45. The place could do with a bit of a make-over or, at the very least, a lick of paint. It’s very dull with NO atmosphere. Four tables are firmly bolted to the floor each with six chairs. At the counter, I ordered the chicken curry with naan bread. I was asked did I want anything to drink. I suggested a glass of ‘ordinary’ water, whereupon the staff member rang up an extra €1.20 on the till. I changed my mind, paid my fiver and sat down. The food arrived about 7-8 minutes later, on a tray. Let’s start with the good points. The naan was freshly cooked and warm, with some nice crispy charred bits. The bowl of curry had a sprinkling of fresh coriander on it. Erm … that’s about it. So. The not so good points. The curry was VERY oily. 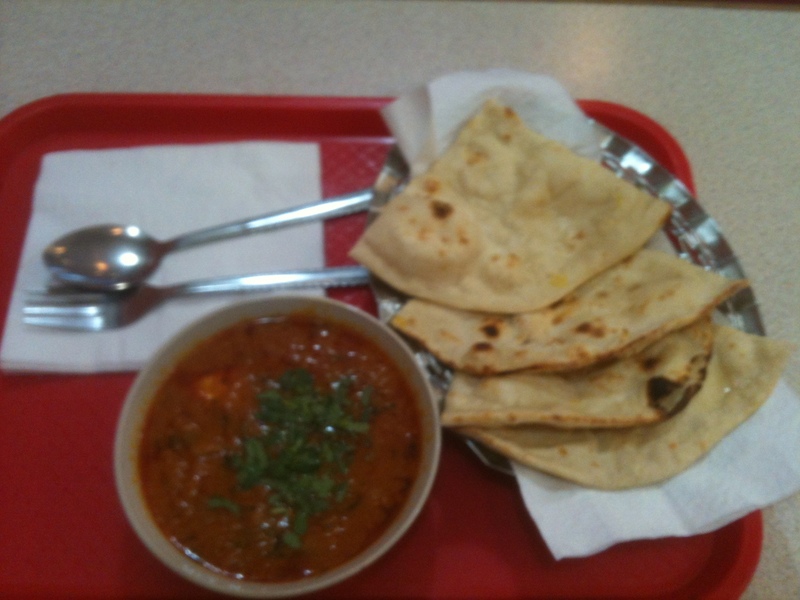 It contained a lot of sauce (I’m pretty sure from the taste that it was Patak’s Balti sauce – blandness in a jar). Buried in the sauce were four smallish cubes of chicken – the sort of chicken cubes you’d get in your run of the mill take-away: processed, tasteless and with a texture that isn’t quite what you’d expect from chicken. eatforafiver’s standards are not high by any means. But this didn’t meet them. It didn’t even come close. I ate it, for the cause, but as I type this, I’m regretting it. Much. I can’t think of anything else I want to say about Zaika. I’d suggest you give it a miss. A little way along Lower Stephen Street, going towards Aungier Street there’s the Wok In, offering various noodle dishes in a box, for a fiver or under. There’s one table but no chairs but I might bend my rules a bit and try it out. 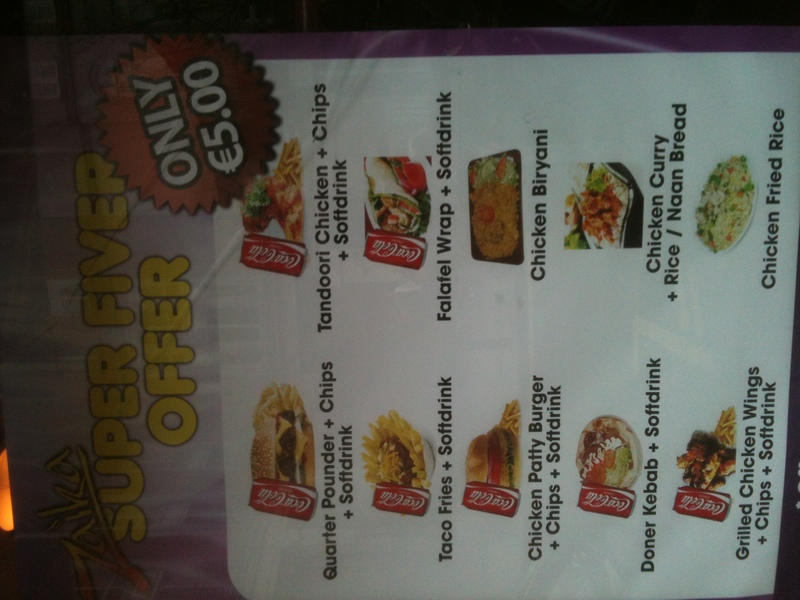 Next to it is another place offering pizza slices, chips and a drink for a fiver. I think it’s called Sufi’s. Over the crossroads, on Upper Steven Street is a guest house (yeah, I was wondering that too) with a restaurant/bar on the ground floor. 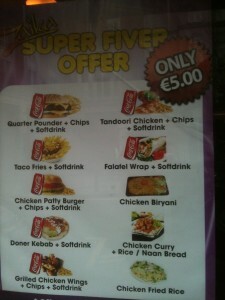 A board outside advertises various specials, including steak pie and chips, for a fiver. I’ll explore these in more detail in the future. I wouldn’t have gone to this place if Margaret E Ward (MD of ClearInk and inspiration for and founder of womenonair) hadn’t suggested it in a comment on a previous post. There’s nothing on the windows of the China Cottage/Han Yang to suggest that it offers anything for a fiver or less. 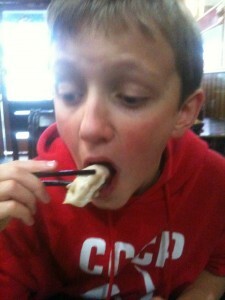 But Margaret said that it did Dim Sum-type dishes for as little as €1 so we had a closer look. Pasted to the wall beside each table was a menu, mostly in oriental script, but with some English, and helpful pictures of some of the food on offer. 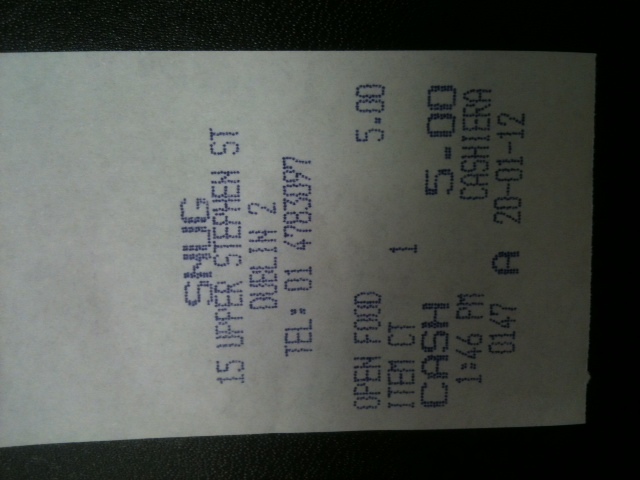 And yes, some of the items cost as little as 50c. We, in this case, were the young lad (not back to school yet) and me. I must say that I prefer to do these eatforafiver things with some company and the young lad will try most things (once, at least), gets into the spirit of the adventure that is cheap food and is a good dining companion. We were approached by a sceptical staff member. I say sceptical because she kind of looked us up and down as if we might have strayed into the wrong restaurant by accident. We were the only European-looking people there, sure, and maybe she felt that we weren’t really looking for the food she had to offer. She even checked to see whether we really wanted oriental food. Anyway, we consulted the pasted up menu and made our selections. She wrote them down and pointed to a few pots of broth and other items that were laid out on a table to the side of the restaurant. She said something that I didn’t quite hear and went to fill our order. I confess to having been a little apprehensive about approaching her again to explain what everything on the table was and what we were supposed to do with it, so we just filled a bowl each with what turned out to be a very tasty soup containing rice, some molluscs and bits of ham. Some of our order arrived soon after and we tucked in. 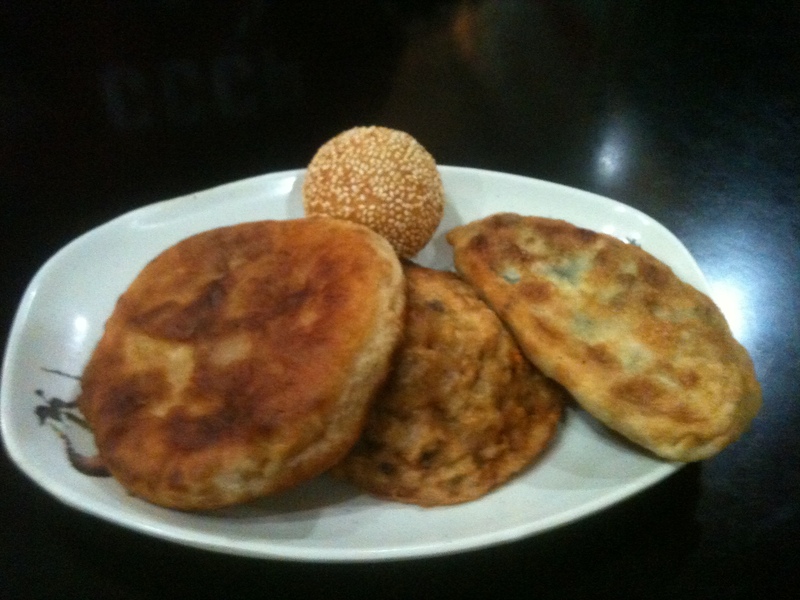 The first batch of food comprised a fried dumpling with chives and egg (€1), a pork meat pie (€1), a deep fried sesame ball with red bean paste (50c) and an oyster pancake with pork and veg (€1.50). We divided each item in half, grabbed our chopsticks and ate with relish. They might not look that appetising in the photo but they tasted good, with flavoursome fillings. The only item the young lad wasn’t keen on was the sesame ball, and mainly because the red bean paste was quite sweet and he felt it didn’t go well with the sesame seeds. Just as we had finished the first batch, the rest of our order arrived. 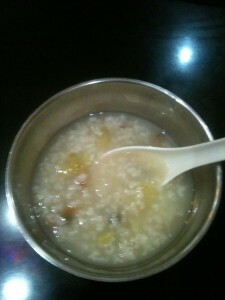 Unlike batch #1, which appeared to have been pre-prepared and ready for serving, the other items had been freshly prepared. 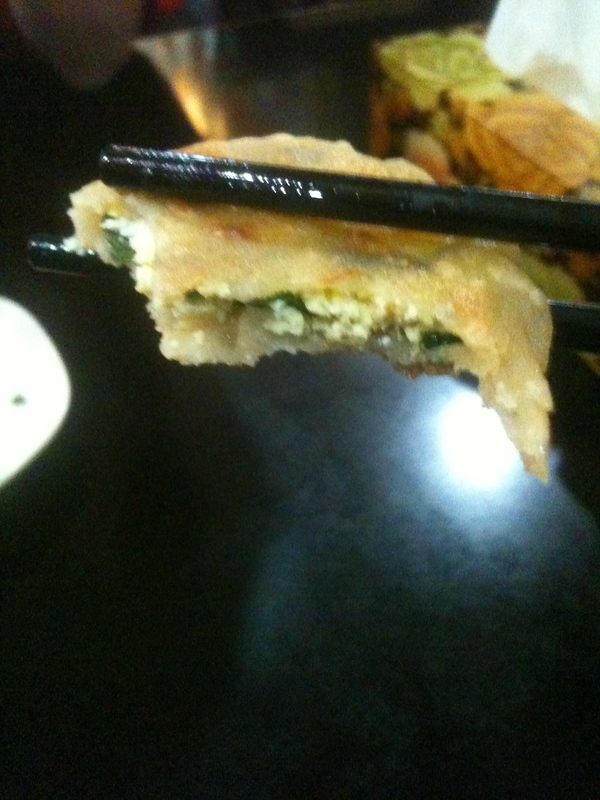 They were a scallion pancake (€1) and six steamed dumplings (€5). These were gorgeous. The scallion pancake was a bit like a paratha, with a flaky buttery texture and a lovely mild spring onion taste. 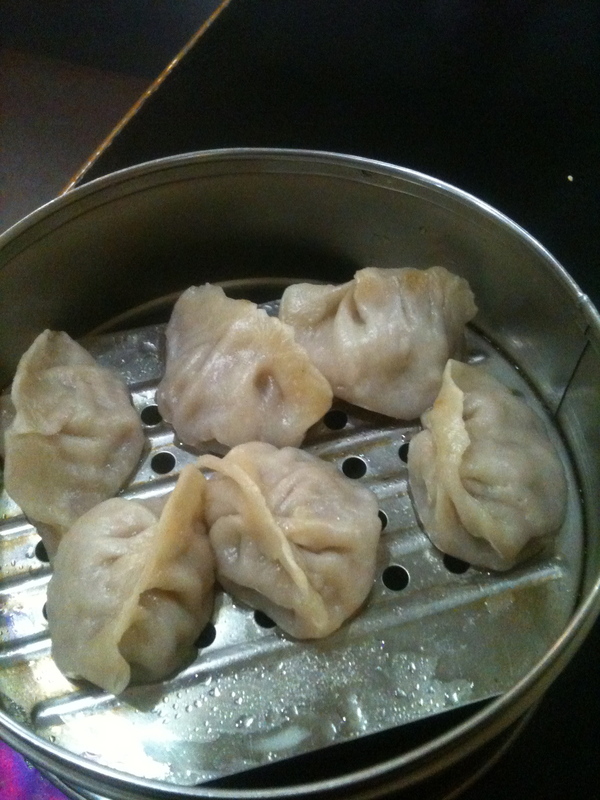 The dumplings were moist and soft, with a very tasty pork-based (I think) filling. Our surroundings were plain and quite utilitarian and there were just three other solo diners (who evidently did know what to do with the broth and food on the table I referred to earlier). 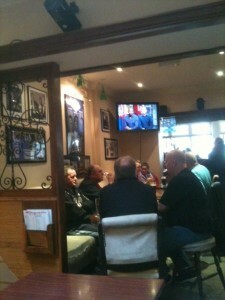 There’s a big TV on the wall in one corner, tuned to an oriental channel. For food this cheap, surroundings don’t bother me, as long as the place is clean. And it is, although the toilets could do with a bit of a mop and someone to empty the overflowing bin. We didn’t hang around once we’d finished. 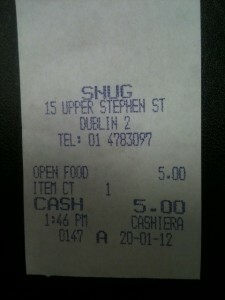 When I went to pay, the sceptical staff member asked how we’d liked the food. We told her we enjoyed it and her scepticism vanished immediately, replaced by a warm and broad smile. We did enjoy the food. In fact the young lad was most impressed, suggesting that it was ‘up there’ and saying that he’d like to come back. So, finally … a confession. The food for the two of us came to €12. Ooops! 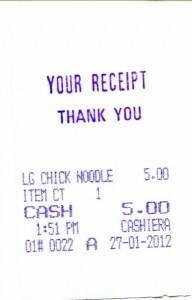 I didn’t factor in the soup when calculating the cost initially. 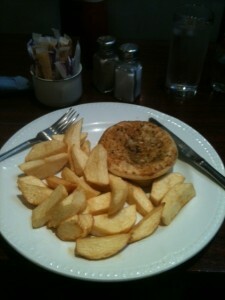 Without the soup, it would still have been a good value lunch. Alternatively, we could have had the soup and a few other small dishes rather than those lovely dumplings and got away for a tenner for the two of us.